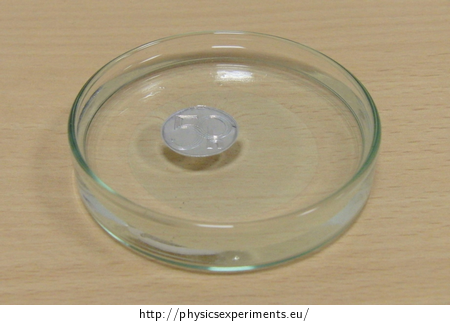 We will demonstrate with this experiment the fact that light objects can float on water surface. 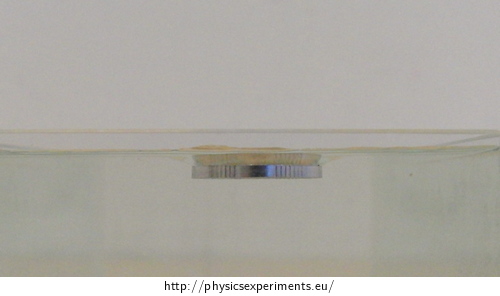 The surface of a liquid behaves like a thin elastic membrane. If we put a light object on such surface, it will stay afloat and will not sink. This phenomenon is caused by the surface layer of the liquid. Molecules of a liquid affect each other with attractive forces. However, these forces act in very short distances and they diminish with the increase of molecule distance. Around each molecule, we can imagine a sphere with such radius, that all forces originating from outside this sphere are negligible. This sphere is called the sphere of molecular action. The resultant of forces of molecules whose spheres are inside the liquid is null. Molecules, whose sphere of molecular action is partialy above the liquid surface, make up the surface layer. Molecules that are in the upper part of this layer are attracted by other liquid’s molecules and the resultant of forces heads down. This force diminishes with the distance from the surface of the liquid. In the upper part of the sphere, molecules of gas affect the molecules of liquid. 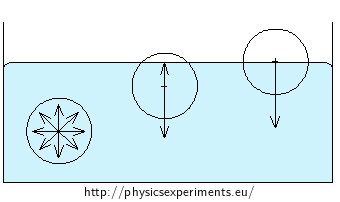 The resultant of these forces is also perpendicular to the surface but heads out of the liquid. The concentration of gas molecules is much smaller than the concentration of molecules of liquid, thus we can neglect this resultant (it isn’t drawn in the picture). Molecules in the surface layer are pulled downwards but there is no more room deeper in the liquid so they have higher potential energy than molecules that are deeper. Carefully place a light object on the surface of the water. It won’t sink. The coin is made from a material with higher density than water, yet it won’t sink. 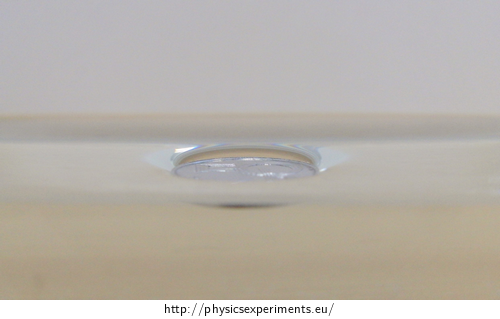 We can see the curviture of the surface layer of water in close proximity of the coin in picture 3. Side view of the coin is in picture 4. We can add dish soap to the water. It will change the surface tension and the coin will sink. The same phenomenon is demonstrated here: Povrchová vrstva kapaliny – plovoucí žiletka (not translated yet).